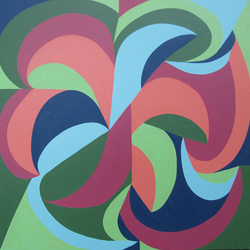 Janet Kurnatowski is pleased to present “Inversion,” new paintings by Jackie Meier. This will be Meier’s third solo show with Janet Kurnatowski, who represents her current work. Please join the artist for an opening reception on Friday, November 19th from 7-9 pm. Meier’s latest body of work explores relationships of unbounded form and color. The elliptical curves, defined by crisp edges drawn freely by hand, are crimped and folded through the incorporation of straight edges. The contours are inverted by the play of intersecting and over- lapping shapes that twist and bend within the picture plane. The shape’s position in space is accentuated with Meier’s dynamic color choices, which reflect her admiration of Monet, Albers and Rothko. Jackie Meier graduated from Pratt in 2003 with an MFA in painting. She has also shown with Denise Bibro Fine Art, Nutureart, Kenise Barnes Fine Art and Broadway Gallery. She continues to expand her vocabulary of painting through teaching at Concordia College and the Pelham Art Center. For more information or images please contact the gallery. The gallery will be closed from December 20 - January 13.